3/1/2004 Well, the IMDB page is finally up. We worked through a few problems, but it's all cleared up now. You can check it out here. Stop by and let us know what you think. 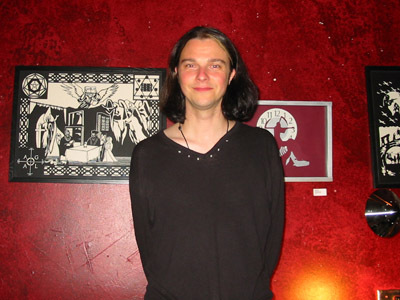 2/6/2004 Tonight, we're proud to make note an Art Opening by Brian Seldt at the Perkatory Cafe. We met him down at last year's HPLFF, and he has since created an amazing Pickman's Model piece inspired by the film. There are some pictures to look at below. Congrats, Brian !!! 1/17/2004 Rick had the honor of sitting in with Edward Martin III, Eric Morgret, and Kelly Young in a panel on independent film making today at RustyCON 2004. Edward pulled it all together, so many thanks go out to him! It was a fun little panel with many good questions, and hopefully some good answers. 12/31/2003 Well, another year has come and gone, though what a year this was!!! It was such fun finishing up the movie...the HPLFF...Horror Movie Night...much fun was had by all. As promised, here's one last little goodie for you for 2003: THE SCRIPT. The last version of the post-production script is now available online...you can access it from the menu at the left. Enjoy !!! We are very happy to report that the last edit (we hope) is currently rendering, so if everything goes o.k. computerwise, we should be officially done in a day or two (the rendering takes a loooong time). Thanks again to everyone who helped and supported us through the ups and the downs, and we'll talk to everyone next year! 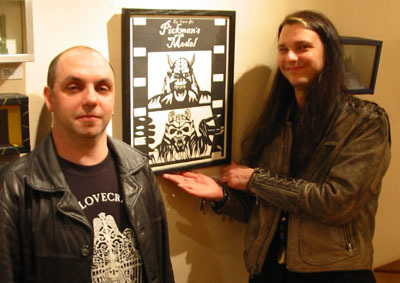 11/30/2003 We've just received word from Jane Rose that Pickman's Model will be shown in New York on Dec. 7, 8pm, at the Dollhaus. Jane, in conjunction with the Reel Sweet Betty film collective, will be presenting a night of short films based on the works of H.P. Lovecraft. Along with Jane's wonderful The Statement of Randolph Carter and Pickman's Model, she will also be showing Christian Matzke's An Imperfect Solution and Bryan Moore's stellar Cool Air. There will also be surprise screenings by Reel Sweet Betty collective members Kevin Freeman and Jeff Velazquez. For all of you out there in NY land, stop by and check it out. It sounds like it will be lots of great fun...and extra special thanks go out to Jane Rose for making it all happen !!! 11/18/2003 We are currently working on yet another edit of Pickman's Model, trimming here, tightening up there, seeing what we can do to make the best finished copy that we can. More info will be coming by year's end, along with all the other good stuff we've promised for months now...In the meantime, we've begun working on three new projects, including a feature-length sequel to Pickman's Model, and a silent one-reeler entitled The Summoning. You can read more about them in the coming months over at Dark Whisper Films. Cheers !!! 10/16/2003 Just a quick note to let you know that we've got another screening coming up in a couple of weeks. We'll be showing the film here in Seattle on Thursday, Oct.30th at The Jewel Box Theater...just in time for Halloween!!! 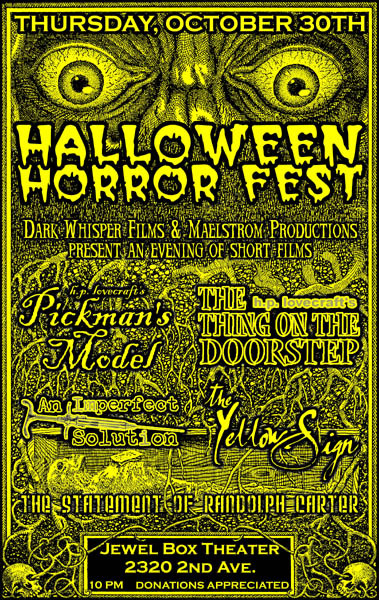 Also on the bill will be Maelstrom Production's The Thing on the Doorstep, Christian Matzke's An Imperfect Solution and Aaron Vanek's The Yellow Sign. Check back for more info about times, etc. 10/14/2003 Well, we just got back from the festival, and have to say that it was a total blast !!! The film seemed to go over pretty well, and we received many encouraging comments. Most of the cast made it down for the World Premiere on Saturday night, which made the whole event extra special. We saw lots of phenomenal shorts this year, most notably An Imperfect Solution, The Thing on the Doorstep, The Statement of Randolph Carter, and festival favorites The Music of Eric Zahn and Cool Air. The HPL documentary, The Eldritch Influence, The Dream Quest of Unknown Kadath, and The Shunned House stood out as our favorite features. We'll get some pictures up as soon as we can. Extra, extra specials thanks need to go out to Andrew Migliore for making this whole event possible (for the 10th time) !!! Thanks to everyone that attended, and we'll see you all next year (and make sure you don't miss Elwood's secret screening). 10/6/2003 The schedule has been finalized for this week's 10th Annual H.P. Lovecraft Film Festival. The World Premiere of PICKMAN'S MODEL will be part of SHORTS BLOCK #3, and will be shown three times: Saturday night at 7:05pm, and twice on Sunday, 2:10 pm and 9:45 pm. Hope to see everyone there, and please stop by and say 'Hi' !!! We also finally have some photos of the cast up in the CAST & CREW section. More to come when we get back from the Fest !!!! 9/6/2003 After seventeen very long months and lots of hard work, we are very pleased to announce that the film has been finished!!! The completed film, with a final running time of 39:57, was sent off to the 10th Annual H.P. Lovecraft Film Festival early this morning. We will let you know specific times, etc. for the festival as we learn them. Many thanks go out to all the folks that helped make this possible! We'll be posting photos, clips, and much more over the next few weeks. We hope to see everyone down in Portland this October !!! 8/20/2003 Well, we spent HPL's birthday working on the soundtrack, and it's going along quite nicely (HP must be looking over us and lending a helping hand!). We're pleased to have been able to enlist the help of Jeff Carrell and Howard Chilcott to assist in the process. 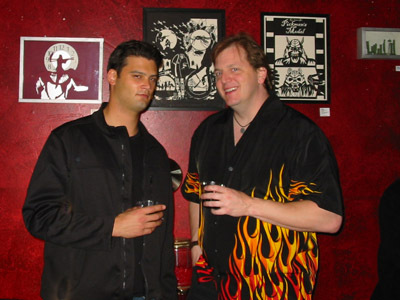 Jeff and Rick were in a band called DINSDALE a few years back, and Jeff and Howard most recently helped write and perform on Geoff Tate's (of Queensryche) last solo effort. Both are talented songwriters and performers, and we're extremely happy to have them on board !!! 2/9/2003 Well....we finally wrapped the production phase of the movie today at Rick's house. The last scene has been shot, and it's all downhill from here...right? Actually, quite a bit of the real work begins now, as we proceed into the editing and sound stuff, otherwise know as 'post-production.' We hope to have it all together for this year's NecronomiCON, as well as the mighty 10th Annual H.P. Lovecraft Film Festival in Portland, OR. We'll keep you posted on how the editing and soundtrack work progresses, as well as try to get stills, etc. available as we have them....Cheers !!! 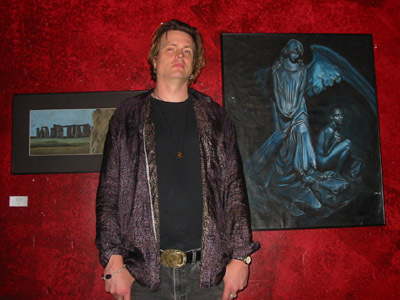 2/2/2003 We celebrated Candlemass by wrapping up the remaining Ghoul shots back in Jim's basement. Boy, we've spent a lot of time there. Jim finally has his house back...and we mean it this time! Shooting will wrap up next weekend as we film the last two scenes at Pickman's house. 1/19/2003 We spent Edgar Allan Poe's birthday back in Jim's basement shooting the title sequence shots...all went surprisingly well. Mary and John did some great stuff !!! We also shot an additional scene with Pickman to flesh out Thurber & Pickman's journey to the cellar later in the film. We hope to wrap up shooting in the next couple of weeks. 1/18/2003 A long, complicated day of filming occurs at Rick's house as we shoot the Gallery sequences. It was great to get all the people that had helped on the film on camera for once, instead of just behind it...Great work EVERYONE, and THANKS !!! 1/8/2003 Shirts are now available in the STORE. Use the link in the menu to check them out. Guaranteed to scare your little sister !!! 1/6/2003 The casting for the additional scenes is complete !!! Dave Hiney will portray ROSWORTH, Jim Serfling will lend his talents as MINOT, and Mary Hiney will assume the role of THE BEAUTIFUL GIRL. Shooting should begin before the end of the month and wrap up sometime in February. 12/31/2002 The Trailer that was shown at the HPL Film Festival is now available in the DOWNLOADS section. Use the link in the menu to access the trailer. Cheers !!! 12/23/2002 Just in time for Christmas: Another long-time stage actor, Alan Wilkie, has signed on to play Pickman's arch-nemesis (DR. REID) during the upcoming 'Gallery' scenes. We're very pleased to have him aboard !!! 12/13/2002 The script is finished !?! We will now begin to finalize the cast for the additional scenes and start working on the costumes for the cast and extras. Well, this year's Festival was fantastic !!! There were many great films shown, and we feel honored to be included in the mix. The trailer seemed to go over pretty well, and we got lots of questions and support from the viewers and other film makers that were present. Special Thanks to Andrew Migliore (who put the whole thing together), Bryan Moore (of Cool Air fame), Aaron Vanek (whose The Yellow Sign was shown this year), and Christian Matzke (who debuted his trailer for An Imperfect Solution), all of whom helped make a great and fun weekend. We can't wait for next year...Check out the HPLFF link in the menu for more photos, etc. 10/4/2002 The schedule for this year's H.P. Lovecraft Film Festival is now posted on their website. The trailer is scheduled in 'Shorts Block 2', showing Friday & Saturday nights, and at the matinee on Sunday. Hope to see you there !!! 8/20/2002 After much rumination, we've decided to (yet again) add more scenes to the movie. They are the original Title Sequence, and some new scenes of Pickman unveiling Ghoul Feeding at 'The Art Club.' Both of these ideas were discussed early in production, but were cut to save time, with the hopes of having the film completed for this year's Festival. Since we've moved the release date to Halloween-2003, we've decided to start pre-production and casting for the additional scenes. Shooting will probably begin in December or January. 8/2/2002 We just received word that the Trailer will be shown at this year's H.P. Lovecraft Film Festival (Portland, OR). We are currently on schedule to have the entire film completed in time for next year's festival. 7/21/2002 Well, after taking a long, hard look at the editing and sound schedules, the decision is made to postpone the release of the finished film until next year. It seems more productive to take the necessary time to finish the film properly, rather than rush it into completion. Editing and finalizing of the Trailer continue, so it can be submitted to the Festival for this year. 7/11/2002 Shooting continues as we move to Pickman's (we mean Rick's) house, for more Pickman-Thurber interaction, as well as Pickman's first lengthy monolgue. 7/7/2002 The script has been revised (for the last time?) to flesh out the remaining scenes and artwork shots. A scene taking place at Pickman's house is added to expand on Pickman's 'philosophic speculations.' Dialogue from The Dunwich Horror is adapted for the purpose. Ia, Ia, Cthulhu fhtagn !!! 6/30/2002 Shooting continues with flashback shots in and around Pickman's Studio. 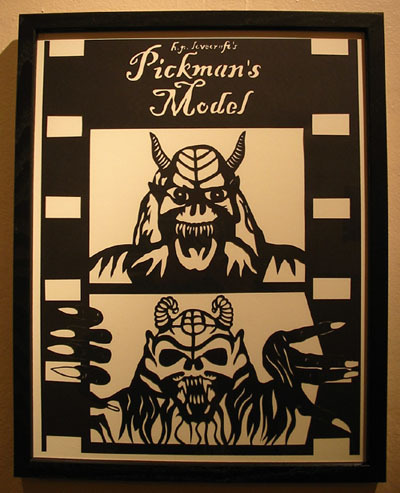 6/28/2002 The script has been revised (still yet again) to finalize the sequence that will take place in Pickman's Studio. 6/21/2002 Shooting continues with our first character scenes. We are shooting more scenes inside and outside the cellar. Pickman and Thurber have their first speaking lines, as well as shooting the major 'action' sequences of the movie. Bryan Sammons and Dave Hiney (also of the Rivertubes) join the team as Cameramen/Crew/Props...and Best Boys! 6/15/2002 The script has been revised (yet again) to polish off the scenes taking place in Pickman's Cellar. 6/2/2002 Shooting begins! We packed all the stuff over to Jim's basement and began shooting the first production footage today. We started off in the heart of the nightmare (the cellar) with the movie's real stars, the CREATURE and the WELL. Various shots of the beast and the well are shot. 5/21/2002 The script has been revised (again) to include additional material, as the creature costume nears completion. 5/14/2002 Casting is finalized for the film. John Lynch will now be playing the title role of RICHARD UPTON PICKMAN (as well as that of THE CREATURE). The change makes immense sense, considering that Pickman will someday evolve into a Ghoul himself. Don Lapora has been cast as ELLIOT, and Rick Tillman will play THURBER. Good luck to everyone! 4/2/2002 Art Direction begins as early Creature designs are crafted. 2/1/2002 Script adaptaion begins, as Don Lapora, drummer of local Seattle band, the Rivertubes, also signs on to help the film get made. 10/1/2001 Veteran stage actor John Williams Lynch signs on to do the film. He will be playing the part of THURBER, as well as that of...??? 8/20/2001 Film plans begin to take a different turn as the decision is made to switch from Beyond The Wall Of Sleep to Pickman's Model. Jim Serfling, apart from being a talented artist, just happens to own Pickman's old studio...not really, but his cellar will provide the perfect backdrop for the efforts to come (especially that queer, old brick well in the cellar). His garage will also make the perfect studio...now we just need to find a couple of houses. Early pre-production begins, as we set a goal to have a completed film ready for the 2002 HPL Film Festival. 3/12/2001 Jim Serfling and Rick Tillman continue to work on adapting the story. Early prop and costume ideas begin to take shape. 2/3/2001 Jim Serfling and Rick Tillman, long-time Lovecraft fans, get together to discuss doing a film for submittal to the HPL Film Festival. Beyond The Wall Of Sleep is chosen, and the adaptation process begins.